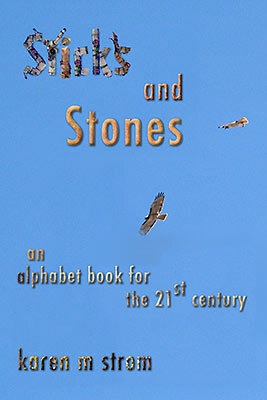 With all of the manufactured news about the Y2K disaster possibility and the "beginning of a new millennium," it seemed to me that a different kind of alphabet book was needed for the new generation that would be meeting this world. I decided to see if I could write one for children growing up on the border of this new world and on the border between the US and Mexico. Since all children now must be computer literate, I wanted to use the book to teach some basic facts about how computers work while at the same time presenting the world we live in as viewed from my perspective. To do this, I wanted to use simple sticks and stones as a vehicle to teach the binary code. I would use the binary code to spell out the words used for each letter of the alphabet book. To do this, I needed relatively short words, all relevant to the other theme of the book, life on the US - Mexico border. These words were not difficult to find for most letters, but, for X, I had to stretch a bit. Choosing the words, taking the photographs, finding the sticks and the stones, writing and revising the text occupied part of my spare time for the next few years. I used the classic form of a children's book here to examine, in images and words, life for those who live both on the edge of the 21st century and on the edge of two nations. These nations have very different cultures and economies and are currently "cooperating" in a drug war where one country is the supplier and the other is the consumer. The cost of this war is high on both sides, but is felt very differently. Among the realities of life here are the rapidly increasing use of digital communication via the internet, with words like bits, bytes, pixels, and dpi being commonly used but usually never fully understood. Online ordering is commonplace, as can be seen at the local post office, where we still must pick up our mail. There is no mail delivery in our rural location. I hope this book can be used at many levels, as a simple alphabet book for younger children, where the animation will intrigue them to ask questions about the content, for older students to explore the ASCII to binary conversion essential to digital communication, and for older readers who are interested in the facts of life along our border with Mexico.